Part of migrating applications from on-premises hosting to cloud hosting (AWS, Azure, etc) involves re-evaluating how users access their data. A recent migration involved users running Windows 10 accessing a Windows file share using the SMB protocol. Since SMB isn’t safe to run directly over the Internet (it’s usually not encrypted and it has a long history of security vulnerabilities), potential options included tunneling SMB within a VPN or changing away from the SMB protocol. One such alternative is WebDAV. Web Distributed Authoring and Versioning (WebDAV) provides the same basic functionality as NFS, SMB, or FTP over the familiar, widely deployed well supported HTTP protocol. It was literally designed for this use case. I evaluated 7 approaches for clients to access a WebDAV share, testing the performance of each and noting pros and cons. Testing was performed in March 2019. The same client, same server, and same connection was used for each test. The client is a Dell Latitude 7490 running Fedora 29. Windows 10 (version 1809 build 17763.348) was run as a VM in KVM using user mode networking to connect to the Internet. For the smb+davfs2 testing, smb+davfs2 ran in Docker running in Linux and the Windows 10 VM connected to it. The WebDAV server is running Apache 2.4.38 and Linux kernel 5.0.0-rc8. The WebDAV site is served over HTTPS. Ping time between them is 18ms average, httping to the WebDAV server URL is 140ms average. Recent versions of Windows 10 support HTTP/2, so for this test, the “h2” protocol was disabled on the Apache server. This test is the same as the previous one except the “h2” protocol is enabled on the Apache server. WebDrive (version 2019 build 5305) was used with “Basic Cache Settings” set to “Multi-User.” All other settings were left at their defaults. WebDrive does not currently support TLS 1.3 or HTTP/2; I suspect these would improve performance. davfs2 is a Linux file system driver which allows mounting WebDAV shares just like any other file system. For this testing, the client is Linux, not Windows 10. Therefore, this test isn’t a real solution (the clients do need to run Windows 10). This test is for comparison and testing on component of a possible solution (Samba + davfs). davfs2 does not support HTTP/2. The davfs2 version is 1.5.4. This test is the same as the previous one but this WebDAV locks disabled by setting “use_locks 1” in davfs2.conf. This test uses Samba to expose the davfs2 mount from the davfs2 test and uses Windows 10 to access the result SMB share. name smb -e USERID=1000 -e GROUPID=1000 --security-opt label:disable -v /home/candrews/webdavpoc:/webdavpoc:Z --rm -it -p 139:139 -p 445:445 -d dperson/samba -s "webdavpoc;/webdavpoc;yes;no;no;testuser" -u "testuser;testpass" -g "vfs objects ="
The biggest challenge with this approach, which I didn’t address, is with regards to security. The davfs2 mount that Samba exposes uses fixed credentials – so all Windows 10 users using the smb+davfs proxy will appear to the WebDAV server to be the same user. There is no way to pass through the credentials from the Windows 10 client through Samba through davfs2 to the WebDAV server. I imagine this limitation may disqualify this solution. This test is the same as the previous one but WebDAV locks are disabled in davfs2. The built in Windows Redirector (which is free and the easiest solution) is by far the slowest. Disabling WebDAV locks improves performance. 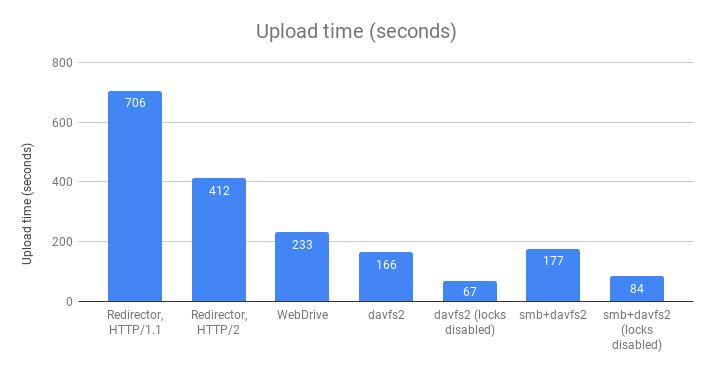 By eliminating the LOCK/UNLOCK requests for every file, upload performance doubled. Unfortunately, disabling WebDAV locks for the built in Windows Redirector requires a registry change, a non-starter for many organizations. WebDrive has locks disabled by default. davfs2 only uses locks when editing files (when a program actually has the file open for writing), not when uploading a new file. Surprisingly, the overall fastest (by far) approach involves a middle box running Linux using smb+davfs2. Adding a hop and another protocol usually slows things down, but not in this case. 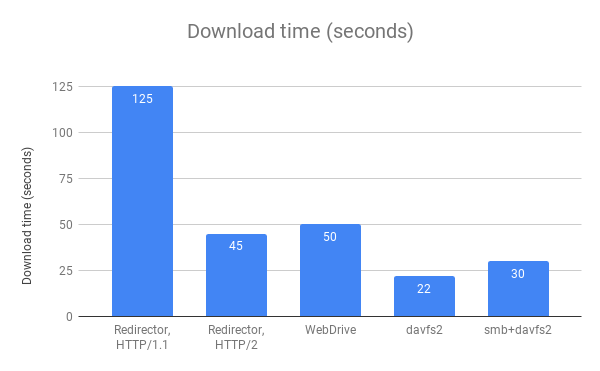 davfs2 is fast because it opens more HTTP connections allowing it to do more requests in parallel. WebDrive supports adjusting the concurrency too; in “Connection Settings” there are settings for “Active Connections Limit” (defaults to 4) and “Active Upload Limit” (defaults to 2). Adjusting these settings would impact performance. The client/server connection was high bandwidth (~100mpbs) and low latency (~18ms). Lower bandwidth and high latency would result in even greater benefits from using HTTP/2 and disabling locking. Integrates with Active Directory for authentication/authorization, but setting up for a large number of users is onerous. Various other WebDAV clients for Windows, such as DokanCloudFS, NetDrive, DirectNet Drive, ExpanDrive, and Cyberduck / Mountain Duck.